Approaching a brand as beloved as Guitar Hero, one that burned as bright as can be, then was extinguished just as quickly thanks to the over-saturation of the genre, cannot be easy. Indeed, there’s only so many ways you can go about bringing back something that was so big. You can go the route we’ve seen elsewhere, and play on nostalgia, and make a game wholly for the fans, or you can go away, come up with an entirely new concept, and hope that it works, and is successful. 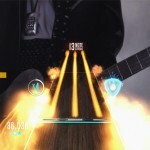 And the latter is exactly what freestylegames has done, because Guitar Hero Live breathes fresh air into a genre that needed it, and it could very well revitalise many people’s dormant love of rocking out with a plastic guitar out, because so many smart decisions are made, and everything about Live feels so fresh and new. From the very get-go, the entire UI has been overhauled, and there’s a clear, distinct division between the core “Live” mode, and GHTV. The elephant in the room is that Live is a FMV game, and there’s really only two types of those: firstly, the one that is funny because the developer has taken it all so seriously, and secondly, the one that is funny because the dev knows it’s stupid, and goes with it. Freestylegames has made a third one: something that feels cool despite itself. Now look, I’m well aware of how it looked pre-release, and I fully expected to be laughing myself silly at the over-the-top “you are a rock star” nonsense. Even as you start, and a long haired roadie talks you through the basics of the instrument, I thought I was going to laugh. Then I realised I wasn’t. After a few three-song setlists in varying sized arenas, something was very right about it all. But it must be stupid, right? So I even drafted in a friend to play it, to ensure I hadn’t lost the plot. I watched him play it – you can see the results of his first play in this video – and noticed he found it to be cool as well. It only gets bigger and better as the setlists go on, and the entire concept somehow works really bloody well. 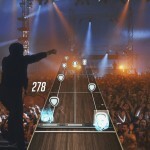 The idea is that you are seeing through the guitarist’s eyes on stage. If you perform well then the crowd will cheer you as the camera swings to a close up view of the most loyal fans. Play badly, and they’ll react accordingly, too. Jumping up a difficulty and initially struggling, as my viewpoint swang to the moshpit, they started throwing cups (of piss, one presumes) at me. It’s utterly silly, but it works as a motivational tool, and I quickly upped my game. The entire thing is seamless, and appears to be hidden behind motion blur as the camera swings hard from one angle to another, and in the moment, it’s like some weird voodoo magic. But the guitar itself is one of the truly innovative parts. Rather than the five buttons and five frets we’re used to, Live splits six buttons across three frets. Three up; three down – these are signified on-screen by plectrum shapes approaching the traditional lanes that are either facing up or down to signify the up or down buttons. They’re also colour-coded, but not in a traditional sense. There’s no orange, blue, yellow (etc) here, instead it’s an empty darker fill for the top buttons, and a white fill for the bottom ones. Thanks to having these two layers of buttons, there are now barre chords (fret two buttons in one column) at once – and these start out simply, but eventually progress to the point where you are nearly playing genuine, real-guitar barre chords. What this all means, is that you have to relearn how you play guitar-based music games. 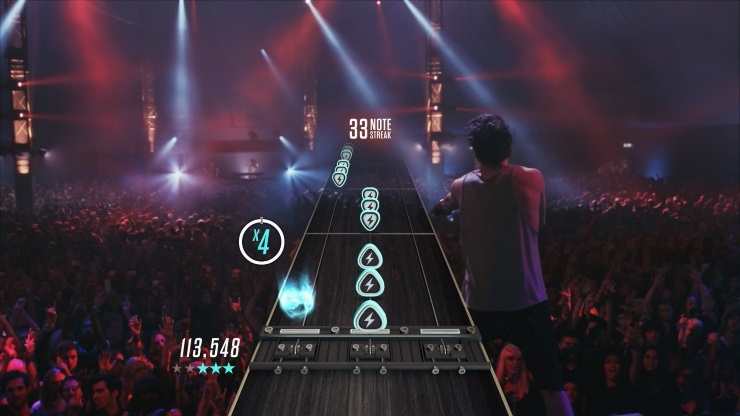 It won’t take too long, and the base mechanics are still there (hold notes and shake the whammy, score multipliers, hammer-ons and pull-offs), but it means that it reduces the need to use your pinky, Guitar Hero Live on higher difficulties is a brutally hard game. The sweet spot for me ended up being advanced difficulty, but I aim to get to expert some time soon. As usual, the songs on offer will be subjective, but there’s plenty here to enjoy: Green Day, Soundgarden, Kasabian, Kings of Leon, Blink 182, and The Who run the gamut of rock and/or indie, but there’re also tracks from Eminem, Katy Perry, Mumford & Sons, and One Republic. There’s really something for everyone, and with support for a mic and a second guitar, you’d have to be fairly anti-social to not get involved. 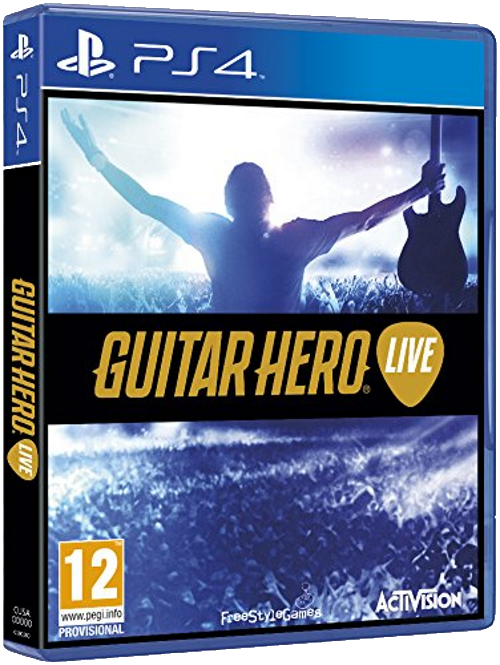 While the guitar itself is well made, and well worth lauding thanks to the innovative input and gameplay changes, I’m tempted to say that GHTV is the true outstanding moment. 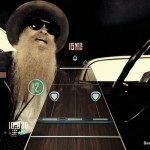 Imagine Spotify for Guitar games, and you’re somewhere near what it is. Currently there are two streaming channels (with a third coming), and you can switch between these whenever you want – even mid song. These are broadcasting music videos 24/7, and have themed shows that change every half an hour. Channel A might be playing the metal show, so you can switch to that and play some metal, but you might come to a song you don’t like, so switch to channel B which is playing Sum41’s “In too deep”. GHTV is a little different to the main game, in that instead of star power (here Hero Power), you use more arcade-like power-ups to change the lane. The first unlock is the bomb, which wipes the highway clear for a few seconds. I’m not a huge fan of that one, because you want to be playing those notes to increase your score, but if you use it as a helper when a crazy solo starts up, it can save your multiplier. This tactical change, along with the free channel switching means that GHTV is something I can (and already have) just chill out, playing songs to. The only penalty for doing badly is that you don’t gain as many coins, and you don’t level up as fast. On that note, leveling isn’t a huge deal aside bragging rights. You progress through the ranks at a decent speed (if you’re good, you’ll level up every five or six songs), but the real early target is to hit level six, as that unlocks premium channels. These are very cool, and open up timed playlists of things like live songs (the Avenged Sevenfold three-song Download fest one is a great challenge, actually) which you can play, mainly as something different. Some require you to hit milestones (get three stars on these three songs) to play them, but you can also unlock them for Hero Cash, the currency that you buy with real money. There’s a traditional song catalog elsewhere, which you can buy song plays (though they are not DLC: you never “own” these tracks) using play tokens. Although you can buy Hero Cash for real money, I never felt like I needed to do so. Play tokens are given away at regular level-up intervals, and thanks to the superb channels idea, I had only actually unlocked two or three songs, yet had over thirty tokens. This system feels designed in a way that the tokens are only for when you really must play “that song”, right now. Every song you play (in every mode) earns you coins, and you can swap those coins for tokens, too. So, yes, there is a real world micro-transaction here, but I can’t see a time I’d ever consider using it. Every song in this list is available to play for free on the channels anyway. So that’s three currencies: Hero Cash (real money), coins (earned by playing), and play tokens (a bit of both). I tell you this only to be completely up front about it. Again, I never felt pressured to put real money down, and I honestly cannot see a point that I ever would, anyway. Where Live’s main “career” mode is about making you feel like a rock star, GHTV feels like putting you in control, and allowing you to chill out with that Spotify style system, with a generous 200-odd songs to go through, and more coming. It’s worth mentioning, too, that in GHTV you are always competing with the rest of the world. A small piece of the UI on the left shows other people playing (currently, and banked scores), and in the premium playlists you’re even awarded points in a table at the end of the setlist. It breeds a competitive attitude, but it’s also something you can completely ignore. 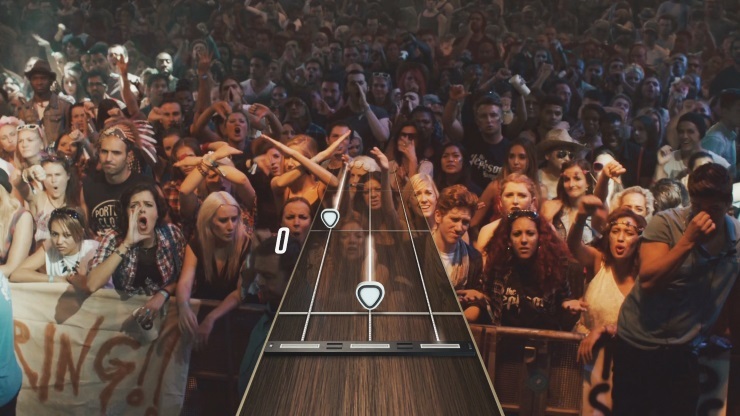 I didn’t expect to fall for Guitar Hero Live the way I did. The new guitar is superb (they’ve retained that clacky sound on the strum bar, by the way) and makes everything feel brand new. 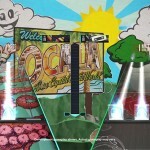 GHTV, however, is truly innovative, and means you can just sit there and play for as long as you fancy. If you want to drop out, or suddenly stop, then do so – there’s no penalty, even the second player can drop out without interrupting play. The FMV of the career mode somehow works and is genuinely exciting, too. 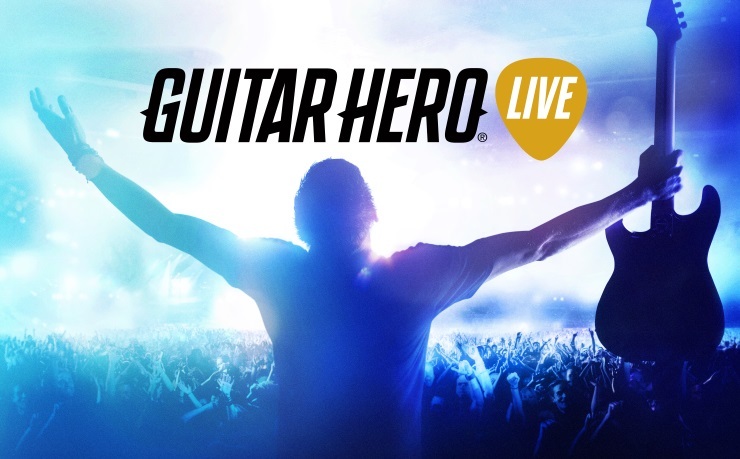 Ultimately, Live is a phenomenal return for Guitar Hero, and one that everyone involved should be proud of. To fans of the genre, this is something new and enthralling. Absolutely brilliant. Review code and a second guitar provided by publisher. GHTV is innovative and brilliant. Feels fresh and exciting again. FMV won't be for everyone.